and expand these in a Fourier series whose terms determine the Fourier components of the electrostatic potential. Since the Fourier representation of a delta-function requires infinitely many terms, the Fourier space calculation would again lead to convergence problems. The solution is to split up the potential in two well-behaved parts, one being represented in -space and the other in -space by rapidly converging series. We demonstrate this on a one-dimensional ion lattice with a charge distribution as depicted in Figure 9.1.
to form an auxiliary lattice . A further lattice ( ) is then introduced to compensate the additional Gaussian charges, such that ``lattice 1 + lattice 2 = original lattice''. 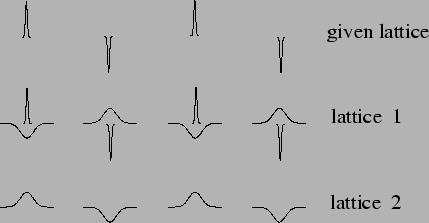 Lattice : Seen from a greater distance, a Gaussian charge cloud resembles a delta-like point charge, effectively compensating the original charge it accompanies. The effect of lattice is therefore best computed in -space, where the series will converge quite rapidly. The convergence will be faster if the Gaussians are narrow, i.e. if the parameter in 9.1 is large. Lattice : The potential sum is evaluated in -space. When the Gaussians are broad, i.e. when is small, we will need a smaller number of Fourier components. By suitably adjusting , optimal convergence of both series may be achieved. Proceeding to three-dimensional model systems, we consider a cubic base cell with side length containing charges. where is a translation vector in the periodic lattice. The Gaussian charge clouds will formally interact with themselves, giving rise to a spurious contribution to the potential energy; this contribution must be subtracted in the final formula. - take the limit of an infinitely large repeated array; this limit still contains a contribution from . Another interesting class of particles are those with embedded point dipoles. Several methods have been devised to deal with the long range contributions in these model systems. One is a modification of the Ewald sum; it is known as the ``Ewald-Kornfeld summation'' technique. Other strategies are the reaction field method and Ladd's multipole expansion method; see [VESELY 78] and [ALLEN 90].